Winter break is here for the kids! A whole week or two off to fill the kids’ schedules with fun stuff to do if you’re not going away on vacation. A trip to the movie theater is in order since there are a couple of blockbuster movies that just came out and they pass the litmus test for child-appropriate as well. 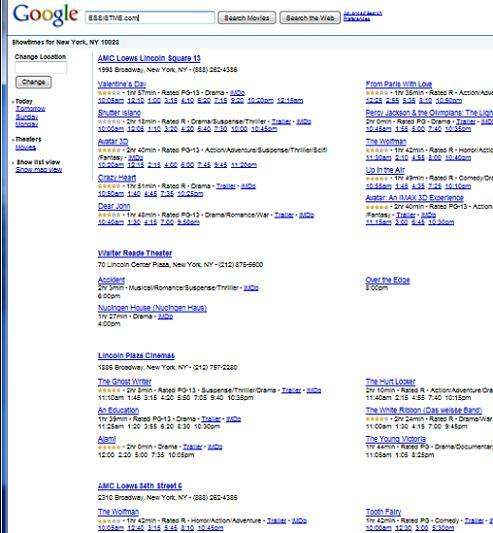 Google has a search built just for movie theaters and listings. You can search by zip code, but movie, or by theater. There are links to reviews as well as listings for future dates so you can plan your movie nights out this weekend. Just go to http://www.google.com/movies and type in your zip code to start your search!